Next on our itinerary after Riomaggiore was a few days in Florence, capital of the Tuscany region and the birthplace of the Renaissance. 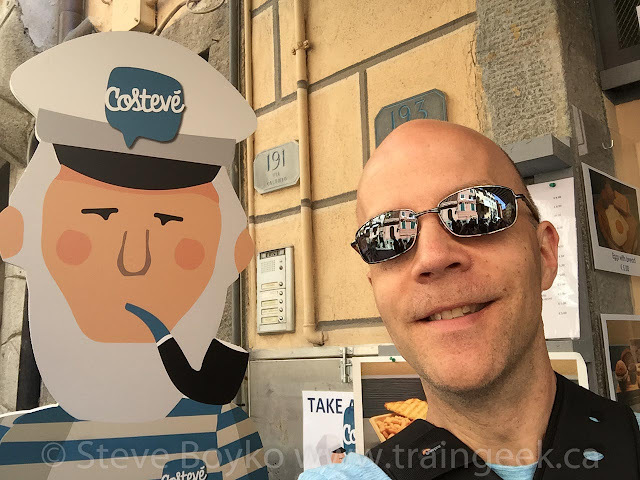 We rode the local train from Riomaggiore to La Spezia, transferring to a high speed train for the trip to Florence... after I took this selfie with another "Steve". You'll notice I was wearing sunglasses there. I rarely wear sunglasses because I usually either lose them or sit on them. At least I am treating my progressive glasses a lot better than I treat sunglasses! Anyway, here's a train we saw, at La Spezia I believe. 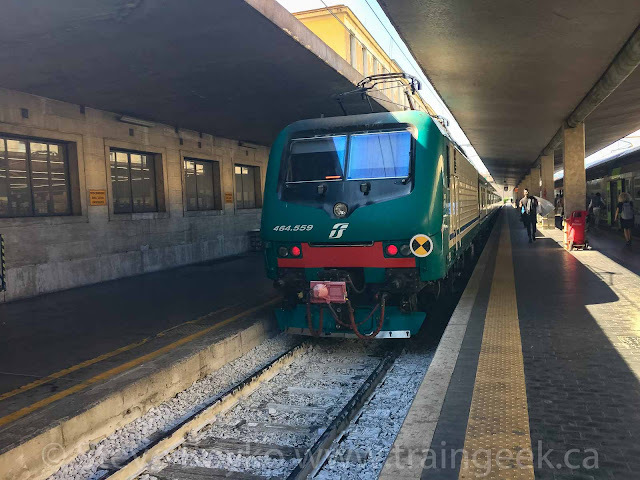 The train we took to Florence was bi-level. I honestly don't remember if we went up or down. I imagine we went up. 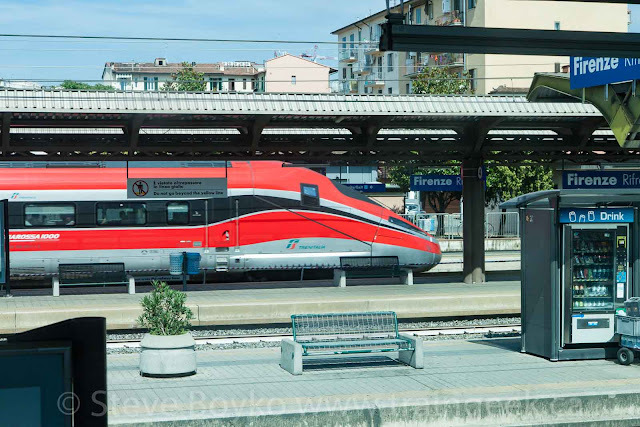 There are electronic signs at Italian stations announcing what train is next. 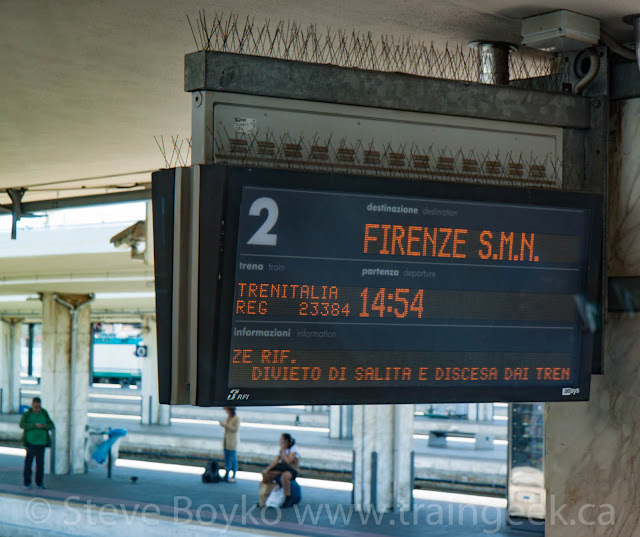 Note the pins sticking up to discourage pigeons from roosting and, er, fouling the signs. There are a lot of interesting towers along the rail lines in Italy. Most look abandoned, maybe junctions that used to be controlled from here. I really like the look of the towers. 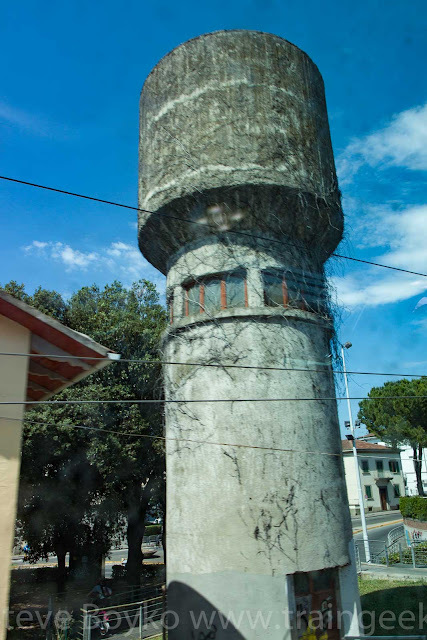 They remind me of the conning towers of submarines or the islands on aircraft carriers. One more similar to the others. I like how they are similar but not the same. This one was quite different... and covered in ivy. I loved those towers... very different than North American towers used to be! I like industrial switchers. 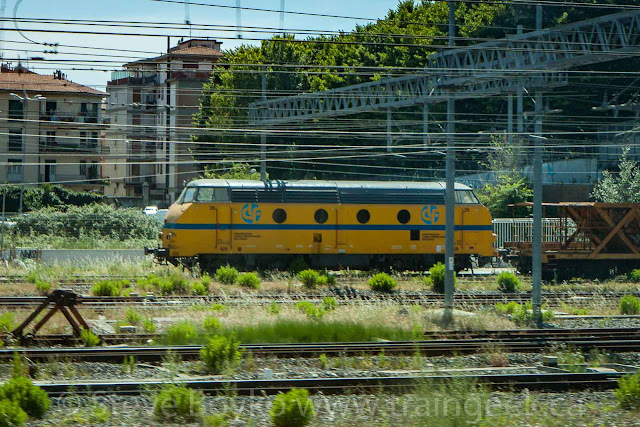 I was fortunate to spy a few of them along the route between La Spezia and Florence. Note the two above - one much bigger than the other! These little critters probably don't pull much, but they'd be perfect for maintenance of way work! Here's an older but larger diesel I spotted through the window as we rolled along. It looks a bit like the German DB Class V 200 locomotives. 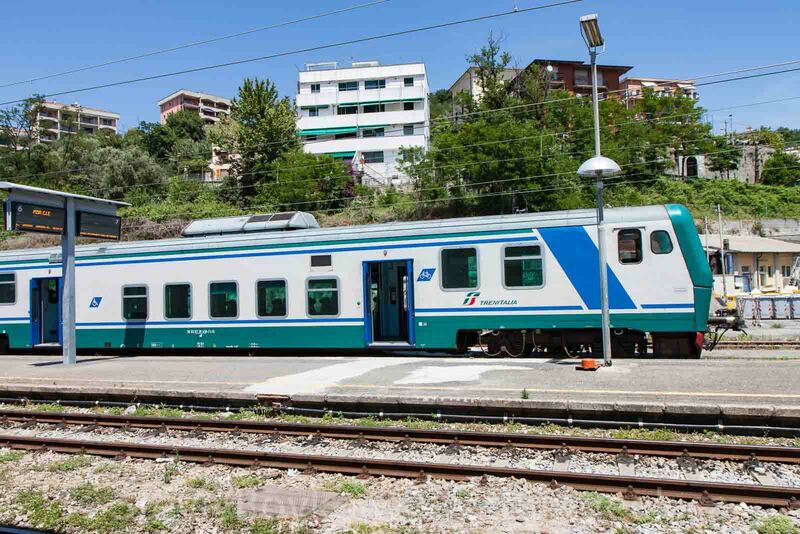 Indeed, 13 were sold to various small Italian railway operators. If you squint really hard, and have the original photo, you would see that the blue logo on the side is "CLF". 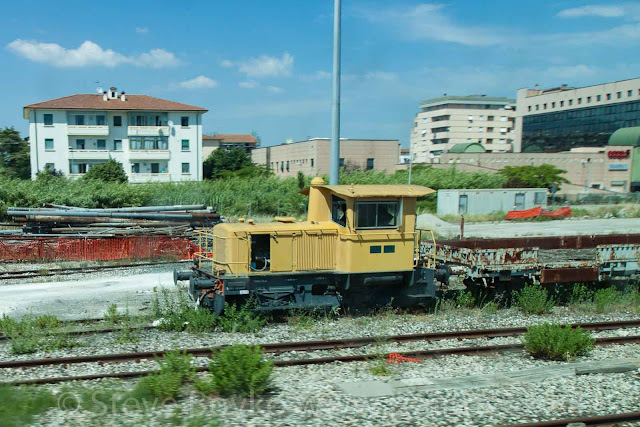 This stands for Costruzioni Linee Ferroviarie, which I think is a subsidiary of Strukton Rail. 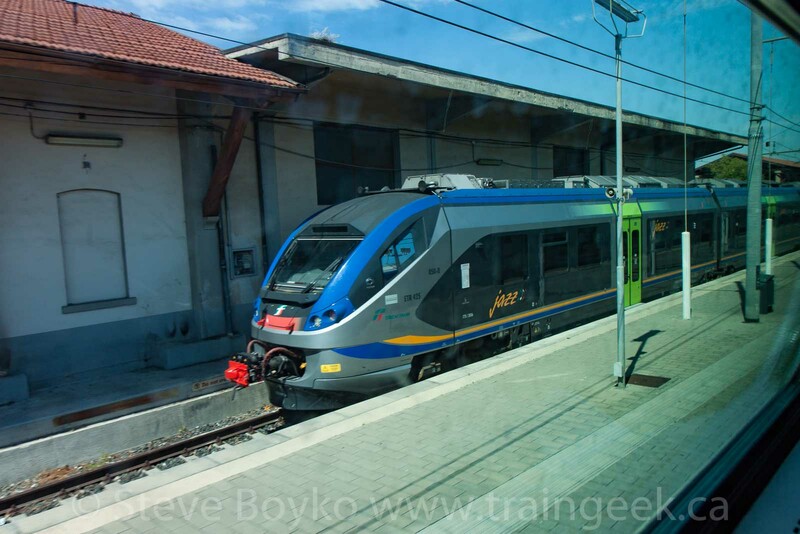 Here's another ETR-25 "Jazz" trainset, built by Alstom. I really liked the next train. It looks fast. 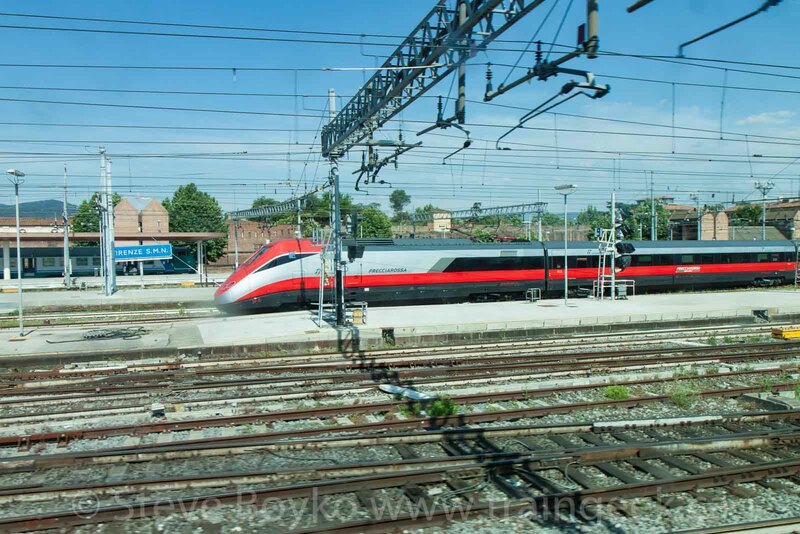 This is the Frecciarossa trainset, pride of the Italian fleet, capable of reaching speeds of 300 km/hr. 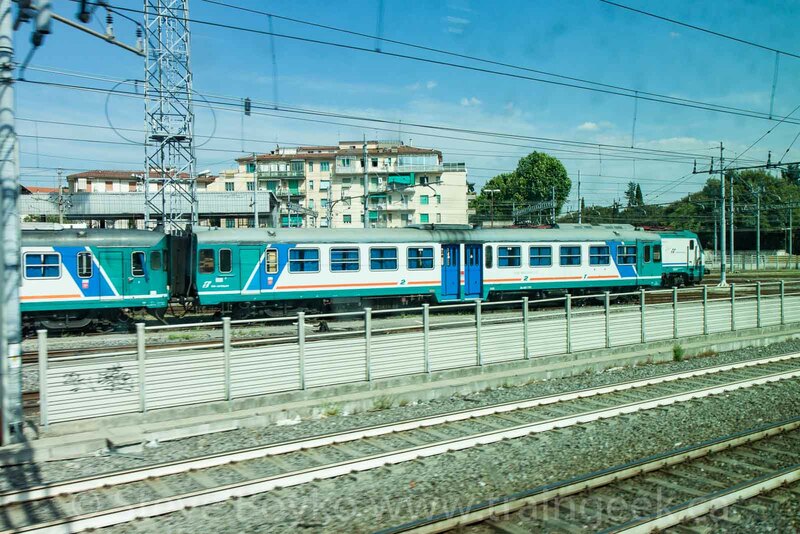 There are actually two different Frecciarossa styles, the ETR 1000 and the ETR 500. The ETR 1000 is newer, capable of 400 km/hr. 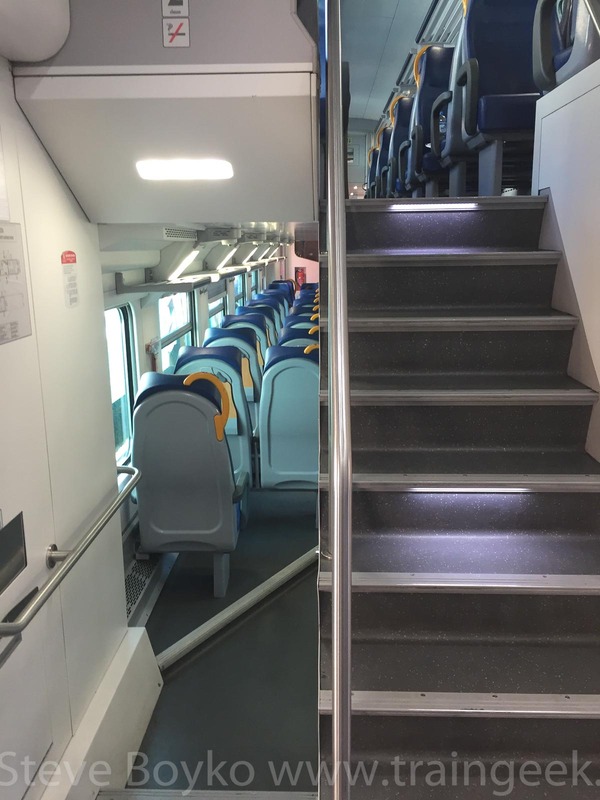 It has four classes of service onboard, power at every seat, onboard wifi with Internet... a pretty sweet way to travel. 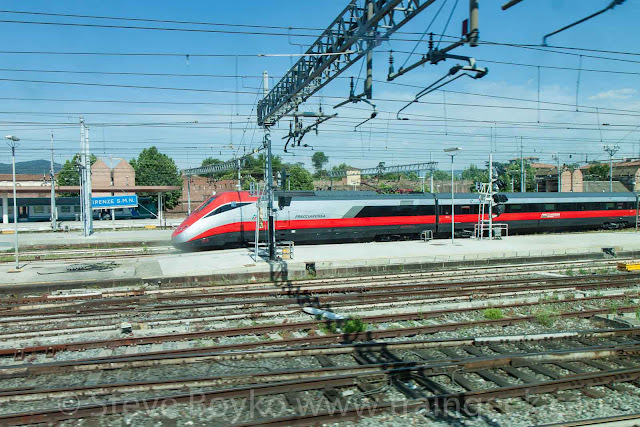 The ETR 500 has similar capabilities, but can "only" reach 300 km/hr. 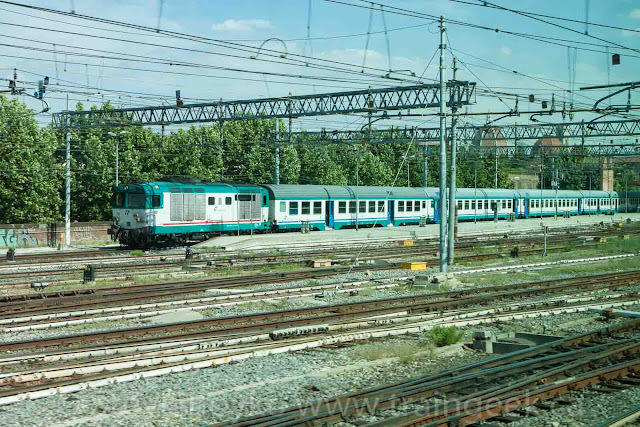 In reality, both classes only reach 300 km/hr as that is the practical speed limit on the Italian railway network. Below, an ETR 1000 at the Firenze Rifredi station. There are four train stations in Florence, with the Santa Maria Novella (S.M.N.) being the main station. 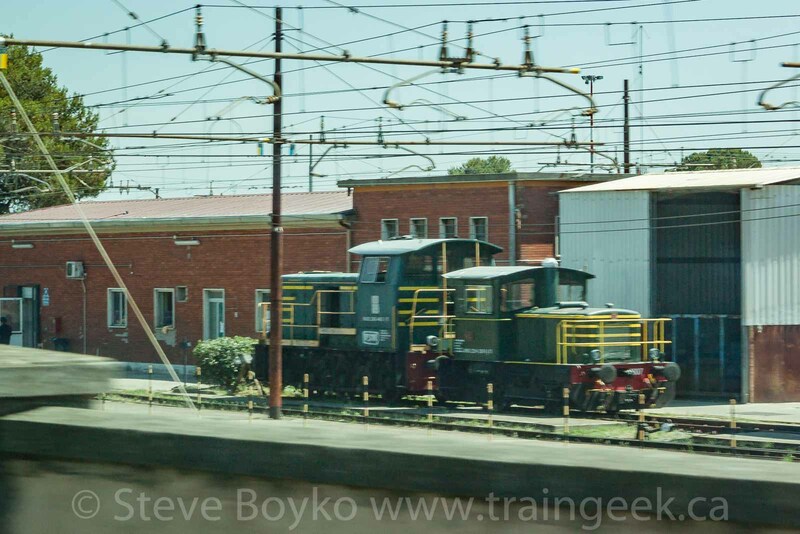 Just to break things up, here's a more conventional train. I like those blue doors. Back to the high speed trains for a moment, a Frecciarossa ETR 500 coming into the Firenze S.M.N. station. 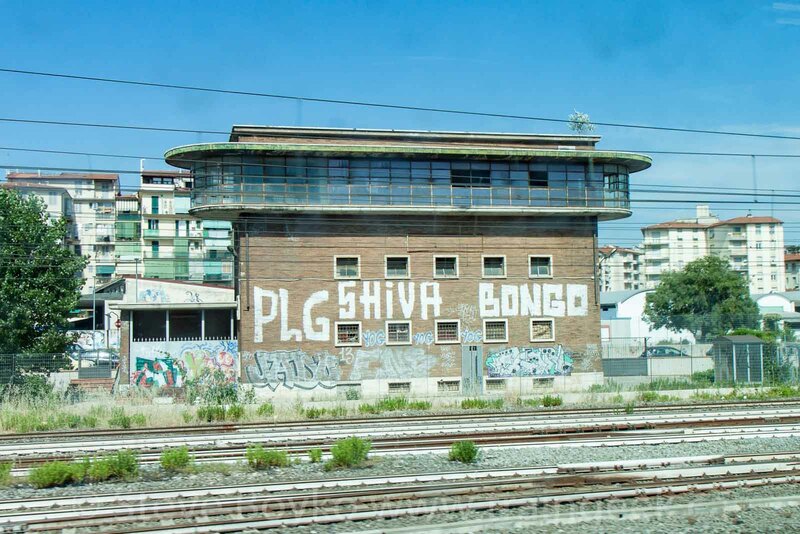 We were also coming into the station to end our trip from La Spezia to Florence. I liked these track bumpers - very different than the North American variant, due to the different bumpers on the end of rail cars. In North America, the couplers are the only contact point between cars, whereas European cars have spring loaded buffers and chain couplers. 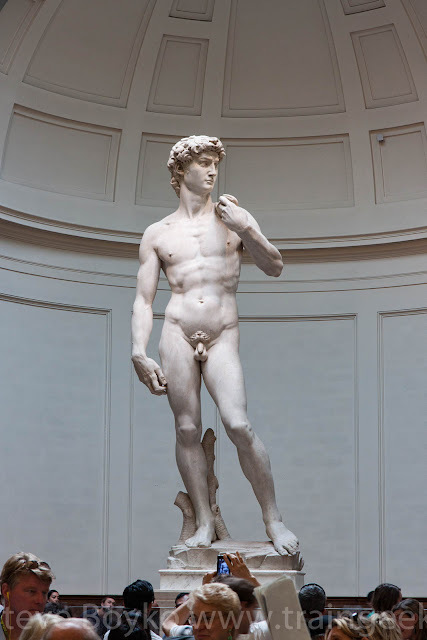 Oh David, you're so fine, you're so fine, you blow my mind hey David, hey David. 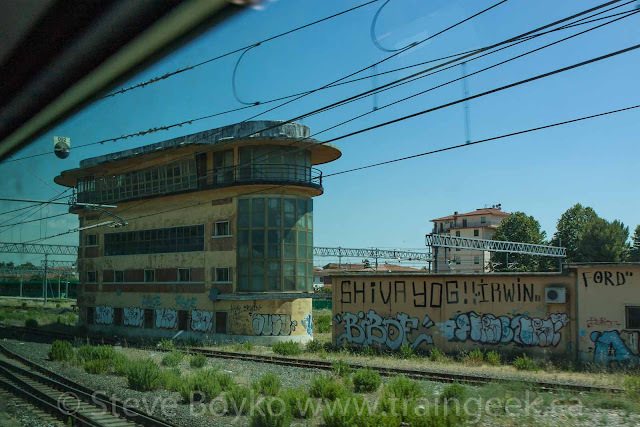 Again, this isn't a travel blog, but I'll include a few photos from Florence to give a taste of the area. Michelangelo's "David" is of course a highlight of Florence. I hadn't realized the statue was so big - it's 17 feet tall. There was a giant toy store a few doors down from our hotel. This store, Dreoni, was founded in 1923 and has a large presence in the city block. 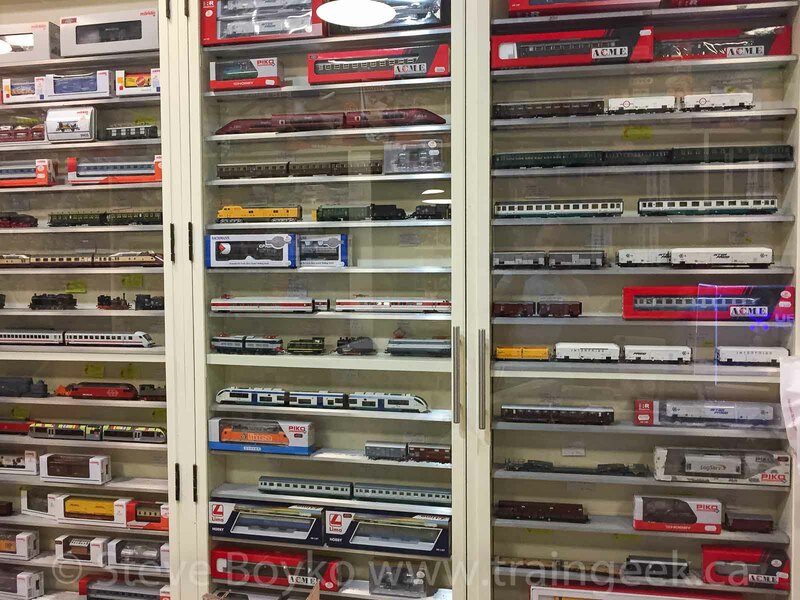 I was particularly interested in the model train section, of course. 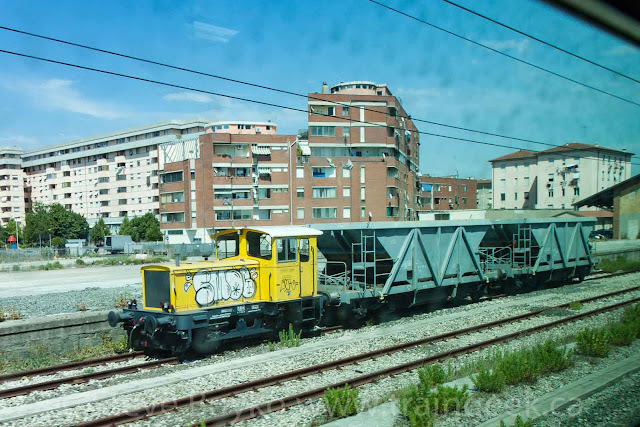 Check out that Bachmann CP Rail grain hopper in the middle! 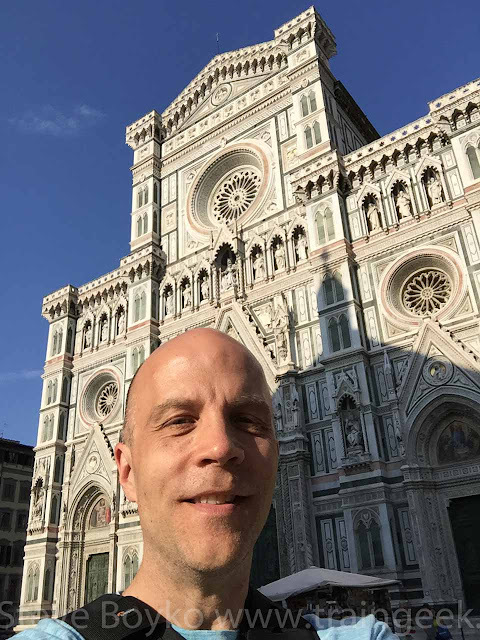 Finally, here's a selfie in front of the "Duomo" (Duomo di Firenze, aka the Cathedral of Florence or Cattedrale di Santa Maria del Fiore). The cathedral, with Giotto's bell tower beside it and the Baptistery of Saint John in front of it, is a major tourist attraction. Its dome was the largest in the world for some time, and remains the largest brick dome in the world. You can see a photo of the dome at the top of this post, taken from the bell tower. So that was Florence. 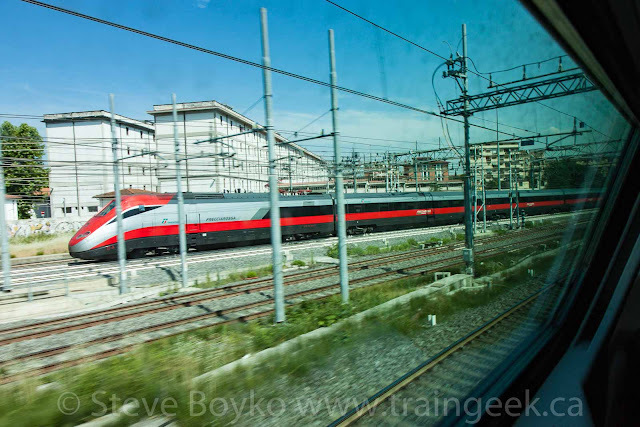 After a few days, we boarded yet another train and headed for our final stop in our Italian tour - Venice. Steve, great summary, looks like a great vacation. Thanks for sharing. 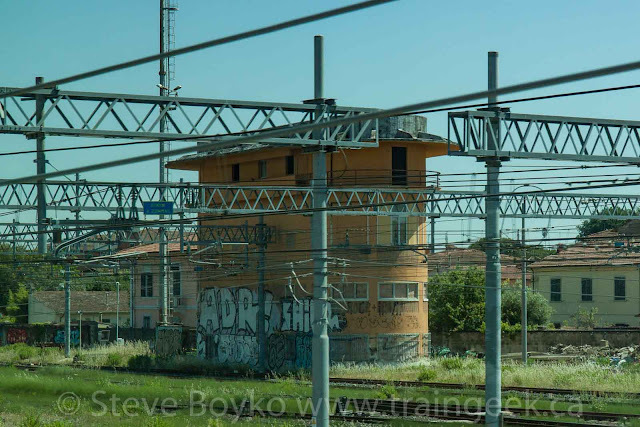 Looking forward to seeing your photos from Venice. Very cool Steve! It always amazes me how different things are outside Canada! Love it! Those towers are very interesting, that first one with all the windows....it should be converted to apartments or something!